Several types of shrimp are kept in home aquaria. Some are purely ornamental, while others are useful in controlling algae and removing debris. 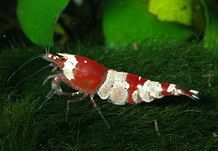 Freshwater shrimp commonly available for aquaria include the Bamboo shrimp, Japanese marsh shrimp (Caridina multidentata, also called "Amano shrimp," as their use in aquaria was pioneered by Takashi Amano), cherry shrimp (Neocaridina heteropoda), and ghost or glass shrimp (Palaemonetes spp. ).